New Delhi: The new allowances for the central government employees is likely to be implemented from October 1, a senior Finance Ministry official told. “Definitely, the new allowances on recommendations of 7th Pay Commission will be made effective soon. However, if its implementation is delayed it will be given effect from October 1,” the official told our reporter. The finance ministry official said the Finance Secretary committee will submit its report by September end. The official said alongside main allowances, the Finance Secretary committee will recommend various reforms in allowances hence it will take some time to implement those after scrutinising. The Union Cabinet cleared the recommendations of 7th Pay Commission in respect of the hike in basic pay and pension on June 29 but decision on its suggestions relating to allowances has been referred to a Committee headed by Finance Secretary. Accordingly, notification and resolution for the implementation of the 7th Pay Commission recommendations in respect of the hike in basic pay were issued on July 25. The pay fixation and arrears related Office Memorandum No.1-5/2016-IC and Corrigendum dated July 29 and dated August 1 respectively were issued for paying arrears in one go in August salary. According to Union Cabinet decision, a Committee headed by Finance Secretary Ashok Lavasa and Secretaries of Home Affairs, Defence, Health and Family Welfare among others as its members was constituted on July 22 for examination of the recommendations of 7th Pay Commission on allowances other than dearness allowance. The pay commission headed by Justice A K Mathur had recommended abolition of 51 allowances and subsuming 37 others after examining 196 allowances. The scrapping of the allowances was opposed by the central government employees’ Unions and so it has been referred to a Committee of Secretaries. The first meeting of the Finance Secretary Committee on allowances already took place on August 4. The once in a decade pay hike has seen burden on exchequer rise from Rs 17,000 crore in the 5th Pay Commission to Rs 40,000 crore in the 6th and Rs 1,02,100 crore in the 7th Pay Commission, Jaitley earlier said. “The Union government needs funds. The Pay Commission has put a burden of Rs 1.03 lakh crore,” Jaitley said in the Parliament in this month. The hike in the salary component as recommended by the 7th Pay Commission was accepted with retrospective effect from January 1, 2016. The arrears will be paid to the Central government employees and pensioners on August 31, Jaitley added. 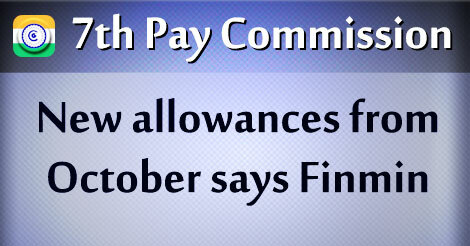 It is noted that no arrears for allowances will be paid, as per usual practice, the allowances would be paid from the date of implementation.